This sweet, perfection-not-needed craft will bring the beach home and make summer last just a little bit longer! We’ve been slow on the web lately, and for good reason: we’ve moved! It’s a new chapter in our lives, and we’re so excited to now be a bit more settled in our new home so that we can get back to delivering you all sorts of sea, sand, and soul. We’ve missed sharing with you! So, what better way to get us back rolling than a crafty adventure to celebrate the home? Amidst all of the boxes to unpack, house projects, and redecorating, we’ve made a sunny sea-inspired craft that’s perfect for bringing the beach indoors. 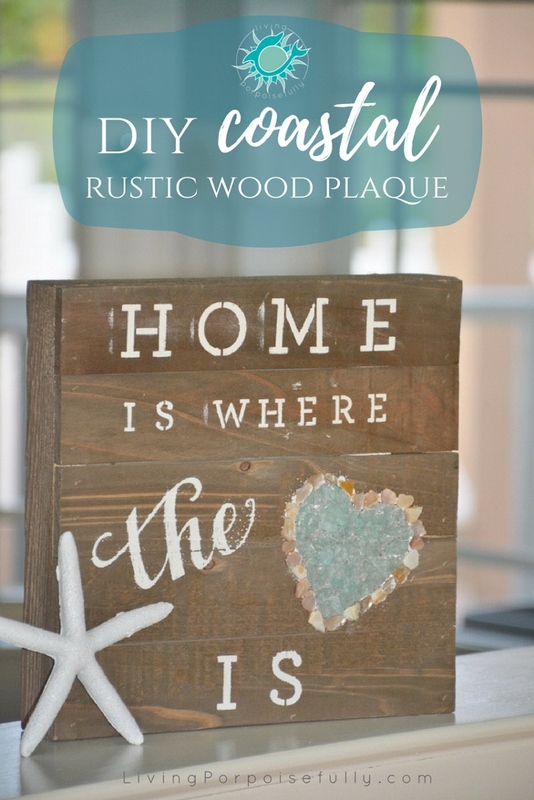 A wood plaque combined with sea glass and shells, plus stencil painting that doesn’t need to be perfect, and you’ve got rustic coastal bliss! It would make for a charming housewarming gift too. So, get inspired, make your own tweaks, and embark on your own crafting adventure that’s sure to make summer last just a little longer! 4. Peel up the stencils and silkscreens, and rinse them. And there you have it! A sweet reminder that home is where the heart is. So glad you “are back”! Thanks for the DIY idea!